Leavine Family Racing has made another change ahead of the 2019 Monster Energy NASCAR Cup Series season. It has hired Mike Wheeler as crew chief on its No. 95 team. He’ll be crew chief for Matt DiBenedetto, who also will be in his first season with the team in its first year with Toyota. Wheeler replaces Jon Leonard, who became interim crew chief on the No. 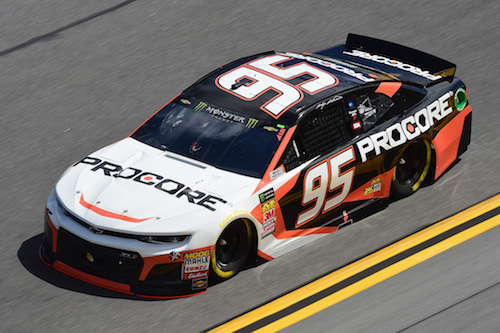 95 during the 2018 season and worked with drivers Kasey Kahne and Regan Smith. Leonard has returned to Richard Childress Racing as an engineer on the No. 3 team of Austin Dillon. DiBenedetto will become only the second driver for which Wheeler has been a crew chief in the Cup Series. Wheeler was crew chief for Denny Hamlin on the No. 11 Joe Gibbs Racing team full-time between 2016 and 2018. He also was Hamlin’s crew chief on the No. 11 team for six races in 2014 as a fill-in for the suspended Darian Grubb. Wheeler also was a crew chief within JGR’s NASCAR Xfinity Series program. Together, Hamlin and Wheeler ran 112 Cup races, resulting in five wins, 36 top-fives and 62 top-10 finishes. They were winless in 2018, Hamlin’s first winless season since becoming a full-time Cup Series driver in 2006. Their 2018 stats include 10 top-fives and 17 top-10 finishes in 36 races.